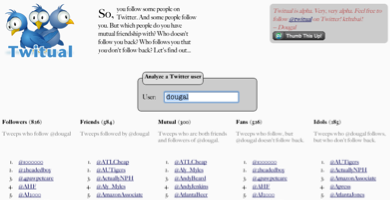 I created Twitual.com to answer the question of which people I followed on Twitter who followed me back, and which ones didn’t. It’s a pretty simple service at the moment, but I am working on a complete rewrite and redesign of the whole site from the ground up. Eventually, it will be much more dynamic and will allow you to follow and unfollow users right from Twitual itself. The original (currently running) version was written in PHP, and the synchronous execution means that users must wait for the server to fetch all of the data from the Twitter API before displaying the results. On the front-end, I use jQuery with event delegation to highlight results in the appropriate columns as you mouse over Twitter handles in the lists.